THE FINAL CHAPTERS: BUSY ELF & ME TOO!!! SO in a surprise turn of events---the elf/elves came early last night while I was out for dinner with sweet Sheila and Rob, AND left a hand written note on the rhyme (Early 8th Day). VERY neat hand writing---so I thinking probably a female---NOT that my male friends are not neat printers--just not usually. But here's Eight nice cookies to enhance your Christmas time." 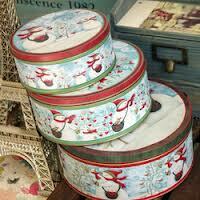 AWESOME---a tin with eight chocolate chip cookies. SO appropriate---I logged 8 miles this AM--SO I will eat the 8 cookies for breakfast--after all they do contain all the required foods---eggs, flour, AND CHOCOLATE!